On Monday, October 24, the delegates had a historic encounter with the Holy Father, Pope Francis. Traditionally, every time the Jesuits meet for a General Congregation, they request an encounter with the Holy Father. Often, the members of the General Congregation are invited to the Vatican for the meeting. In 1983, Pope John Paul II met the members of General Congregation 33 and celebrated Holy Mass with them at the General Curia. 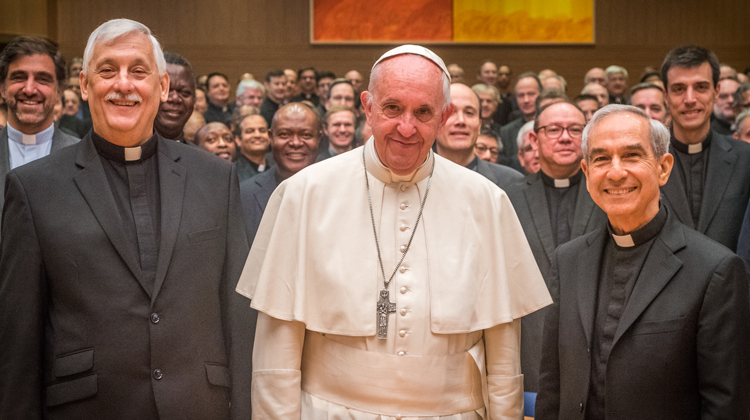 Following in the footsteps of his predecessor, Pope Francis met with the members of General Congregation 36 at the General Curia, and participated in morning prayer with them. After the prayer, the Pope addressed members of the Congregation (the full text of his address is available here).